The line of electricity pylons stops abruptly the minute you step foot outside Chad's brand new oilfield. Beyond its gates, locals in the southern village of Kome, like 99 percent of Chadians, have no access to electricity and get by using gas lamps and firelight. A stone’s throw from the small village, the U.S. oil giant ExxonMobil generates seven times as much electricity to power its 40km-wide enclave as the state-run utility STEE produces from imported diesel in the rest of this poor landlocked country. The Chadian government has promised to change all that with its new-found oil revenues, pledging to upgrade the electricity network, lay new roads, improve water supplies and build new classrooms and clinics. But can this central African country, plagued by civil war for much of its four decades of independence and ranked the third-most corrupt nation on the planet by the World Economic Forum, pull it off? The World Bank, which is monitoring the $3.7 billion oil development project, the largest private sector investment ever undertaken in Africa, is certainly crossing its fingers. The United Nations ranks Chad, a sparsely populated and mostly desert land, as the eleventh poorest country in the world. Its eight million inhabitants scrape by on an average income of less than 70 US cents a day and life expectancy is just 45 years. The oil export pipeline - that snakes for 1,100 km through savannah and jungle from the Doba oilfields in southern Chad, across Cameroon to a mooring buoy in the Atlantic ocean -- was inaugurated one year ago. Some politicians and rights groups declared the day the oil valves on the pipeline officially opened, a national day of mourning. They warned that the government officials would skim off profits for their own benefit, despite the funds being held in an escrow account in London to prevent leakage. With the government having received its first revenues in July, all eyes are now trained on it to see if the petro-dollars will be mismanaged or responsibly spent. “The scheme is good on paper," one senior Western diplomat in the capital, N'djamena, told IRIN. "But we are not there yet, we have got to get it implemented." 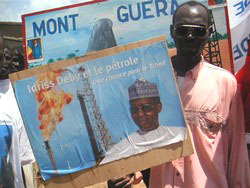 [Chad] Demonstrators in Chadseek greater local benefits from oil industry. Indeed, some of the early signs have been worrying. Not least President Idriss Deby’s attempt to change the constitution so he can enjoy a third term in power. The bill has already won parliamentary approval and now awaits the formality of a referendum. “It’s worrying because of what it signifies in terms of good governance,” said Keith Myers, an African oil specialist at the London-based independent research body, Chatham House. Looking around Sub-Saharan Africa, it is hard to find an oil-producing country that serves as a good role model. The oil bounty in Equatorial Guinea, now Africa’s third-largest producer, has lined the pockets of senior government officials, according to a recent U.S. Senate report, leaving the poor behind. Nigeria, the continent’s top producer, is still reeling from the latest standoff in its oil-rich Niger Delta, home to most of the 2.5 million barrels it exports every day. An ethnic militia group in the Delta is demanding that local people receive a greater share of the cash generated by the black gold on their doorstep. It has threatened to go on the rampage against foreign oil workers unless its demands are met. But Chad hopes to buck the corruption trend, thanks to a deal with the World Bank, which sets strict limits on where the government’s royalties from oil sales can be spent. Ten percent must be held in trust for future generations and another 80 percent must be pumped into education, health, infrastructure and rural development. A special oversight committee with several independent members has been set up to monitor spending. Still, the fact that part of a "signing-on bonus", which was not covered by the royalties law, was used to buy weapons and other military supplies, raised eyebrows and sparked mutterings of deja-vu. But with the first $57 million of revenues now there for the taking, the time has come for Chad to break the continental mould and prove that oil can be a launchpad to a brighter future. “The idea is to use the oil revenues to develop a platform to kick-start non-oil growth,” the Bank’s Marie-Nelly explained. And for this poverty-stricken nation, that means going back to basics. There are, for example, only 650km of paved roads in Chad, a country twice the size of France. During the rainy season, dirt roads get washed away and moving people or goods about is a Herculean task. So a chunk of the first oil revenues will be spent on upgrading a 140 km stretch of road between Bisney and Bokoro, two small towns to the east of the capital N’djamena. “The contracts have been signed, the first payment has been received and work will start... probably in October,” the World Bank’s Marie-Nelly said. Analysts note the small scale of the project, but say, that aside, building the roads is only half the battle. “Of course, you shouldn’t ignore the new roads. But when the oil field eventually declines, will Chad still have the capacity to maintain those roads?” Myers of Chatham House said. A quick tour of Chad shows up the oil/non-oil divide. In the capital N’djamena, an impoverished city with barely a high-rise building, vendors and restauranteurs complain that business is poor. The only people putting cash in their tills are the hundreds of international aid workers who have arrived to help refugees streaming into Chad from the Darfur region of western Sudan. Out in the east, farmers shrug their shoulders as they describe their difficulties in growing even the most meagre crops and keeping their livestock fed. They and their families live in mud huts with straw thatching. But 500 km south of N'djamena, near the 190 oil wells pumping crude to world markets, life is getting markedly better. [Chad] Children in the southern Chadian village of Kayrati show off their new water pump, which their community chose as compensation for the land it lost to the oil development. September 2004. Tin roofs are becoming an increasingly common sight and residents have better access to clean water and sturdier schools. The women of Kayrati village are thrilled about their new solar-powered water tower. Panels soak up sun rays to power an electric pump that raises water from a borehole. 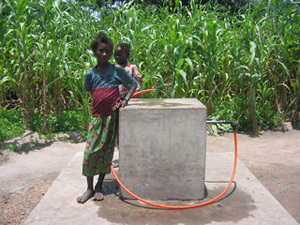 The water tower then feeds clean drinking water by gravity to public taps in the village. The new water supply system is what the 1,700 inhabitants of Kayrati chose in compensation for the bushland they lost to the nearby oil development. "Before we would have to go the well ourselves five or six times a day. Now we can send the kids because it isn't such heavy work and they only need go twice a day," one local woman called Priscilla explained. "We all win -- everyone has clean water, the worms have disappeared from our tummies and no-one gets sick anymore." Down the road in Meurmeoul, school attendance has soared, now that a new brick building with shiny green shutters has replaced the straw shack which previously served as a classroom. GTZ, the German aid agency which is overseeing the oil compensation projects, says the number of pupils has risen almost 20 percent to 198, with some children coming to the new school from as far as 10 km away. And under the watchful eye of the village chief, who is a mason by trade, the 800 residents have gone one step further, erecting a smaller second building to house the teacher. The parent teacher's association cultivated a cotton field and raised 200,000 CFA (US$370) to put a tin roof on the structure. "The knock-on effect is plain to see," Otto Honke, head of the GTZ project, told IRIN. The Chad oil consortium -- which includes the U.S. firm ChevronTexaco and Malaysia's Petronas as well as ExxonMobil -- has so far doled out around $3 million in community compensation. Individuals who have lost crop-growing land to the oilfield development have received a total of $5 million. Some have spent their share of the cash on bicycles and carts. Others have splashed out on treats for the family. With the bulk of handouts over, oil executives are keen to stress other projects they have embarked upon. These include a $400,000 scheme to renovate five health clinics in the area over the next few months. For midwife Martine Beyboto and the 40 patients she sees every week in the dingy Kome clinic that upgrade cannot come quickly enough. 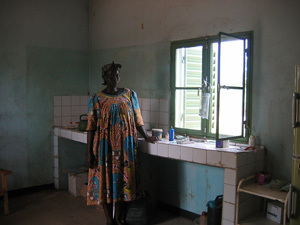 [Chad] Martine, a midwife, cannot wait for her clinic at Kome near the oil field to get its promised refurbishment. The consortium pumping the oil from southern Chad has pledged to improve healthcare in the area. September 2004. "It's a struggle to get by. We don't have the right equipment and we are lacking dressings and gloves and alcohol," she said. But while there is no denying the improvements to some people's lives, many commentators think it premature to start cracking open the champagne. "It is kind of like a little sticking plaster on one small part of the country," said Myers at Chatham House in London. He is anxious about the fact that Chad has enough oil to attract profit-hungry companies, but not enough black gold to turn around the economy as a whole. "Chad is in a dangerous category of developing countries," he said darkly. The international consortium is currently pumping about 210,000 barrels of crude per day from beneath villages like Meurmeoul and Kayrati and exporting it to world markets. But this amounts to less than a tenth of Nigeria's daily output. "The Doba three-field project is expected to produce approximately one billion barrels of crude oil over its life time of about 25 years," Ron Royal, the general manager for the consortium, explained. Chad's government should earn about $2 billion in that time, mainly through a 12.5 percent royalty levied on every barrel produced. However, earlier this week the presidency complained it was being short-changed. "The sale price of Chadian oil is less than 20 dollars. yet the barrel price is 50 dollars on the international market today," it said in a statement. "This practice puts considerable strain on the meagre resources Chad expects of its oil." But however much the government finally nets, its challenge will be to avoid becoming an oil-obsessed nation and to strengthen traditional sectors like agriculture, cotton production and services. Myers, at Chatham House, pointed out that Gabon, another Central African producer, has found it hard to diversify its economy and as a result its growth rises and falls with oil prices or the number of barrels produced. "The important thing for me will be what happens to Chad's non-oil GDP," Myers said. "Oil fields by definition are not sustainable and so the big question is how the government uses the revenues to develop sustainable growth." The World Bank predicts Chad’s economy will grow by about 30 percent this year following the start of oil exports. But Marie-Nelly acknowledges that the non-oil sector of its economy, which generates most of its cash from cotton exports, is expanding at the rate of just two percent per year. All analysts agree that more time is needed to evaluate the success of the 'petrodollars to fight poverty' scheme that Chad is pioneering. Marie-Nelly expects tangible results in two to three years. Others like Antony Goldman, a London-based oil analyst are banking on a longer wait. "In Equatorial Guinea, for example, it's taken 10 years for anyone to come out with solid and absolutely convincing evidence of the degree of abuse and corruption," he explained. "But if Chad can pull this off, they will be the first ones to have made oil into a blessing rather than a curse."